ASFAB are specialist washroom manufacturers & installers. We offer bespoke Laminate Fabrication, Postforming and Solid surfacing. All our products are individually tailored to suit our clients needs. Sure, we are in business to make a profit but we also want you to make one too. We have smaller overheads than many of our competitors and the prices of our toilet cubicles and washroom systems reflect this. We are confident that you will find our rates favourable. All of our shower and toilet cubicles, washroom systems and laminate products are handmade to our clients’ specifications. We have extensive experience in material suitability and always strive to provide a solution and product that exceeds the environmental demands. We don´t bite! What’s more we enjoy building relationships with our customers and go that extra mile to give them our best possible service. We will be pleased to visit your business or site to discuss your requirements, provide samples or assist in site surveys to make sure that your shower and toilet cubicles or washroom systems meet your needs perfectly. No one likes being told ‘you can ’t have that ’ or ‘sorry, not in that size or colour’. Put simply, at ASFAB, we believe in maximum possible choice. In other words, if anyone can do it, we can. 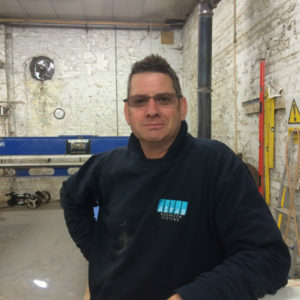 Asfab was born in 1998, following Andrew’s 10 years experience in the Laminate Distribution, Fabrication and Washroom Maufacture Industries. 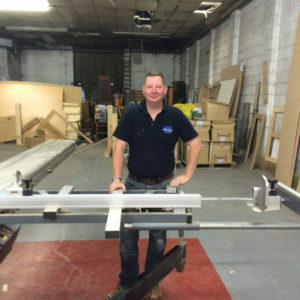 The business started in a small home office and now operate from a fully equipped 7000 sq ft factory in the village of Madeley, where Staffordshire, Shropshire and Cheshire meet. We have evolve from a general Laminate Fabricator & Postformer, firstly into a specialist Washroom Manfacturer & installer and now into a complete Washroom Project Company.